Entering his fifth season in the Yankees organization in 1991, Don Stanford was optimistic, he told The Schenectady Gazette. He was optimistic because the Yankees seemed to be calling up and using their own prospects. "It's encouraging for all the players down here to see that they're sticking with all their talent and they're going to give them a shot to see what they can do," Stanford told The Gazette. "Seeing Steve Adkins and Wade Taylor up there is encouraging for us down here." For Stanford, though, he'd never get his call. He saw AAA Columbus for the first time that year. And he'd see it again the next two seasons. He'd never see the majors. Stanford's career began in 1987, signed by the Yankees as an undrafted free agent out of his native Syracuse. Stanford previously was taken taken by the Blue Jays in the 10th round of the January 1985 draft, out of Onondaga Community College in Syracuse, but did not sign. 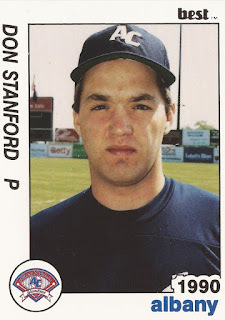 With the Yankees, Stanford started in the rookie Gulf Coast League, going 5-4 over 17 outings, seven starts. For 1988, Stanford played between three teams, single-A Prince William and Fort Lauderdale and AA Albany. He spent much of the year, though, at Fort Lauderdale, with 22 outings while posting a 2.06 ERA. Late that June, Stanford pitched a four-inning relief outing to pick up a win. Stanford split time between Prince William and Fort Lauderdale again in 1989, moving to AA Albany full time in 1990. In June 1990, Stanford went a stretch of eight appearances where he gave up just one earned run, The Gazette wrote. He even got a start in there, going seven innings. "I haven't really changed anything since I've been here," Stanford told The Gazette. "You still have to go out there and throw strikes." Stanford returned to Albany for 1991, then saw time that year at AAA Columbus. He played 1992 and 1993 back at Columbus, but never got called up to the Bronx. Back in late-May 1990, though, Stanford received praise from his manager after an outing where he faced 11 batters, setting down 10 of them and picking up the save. "He's an outstanding setup man," Albany manager Rick Down told The Gazette. "Everybody should have a role on a team. Don knows his role and does it well."